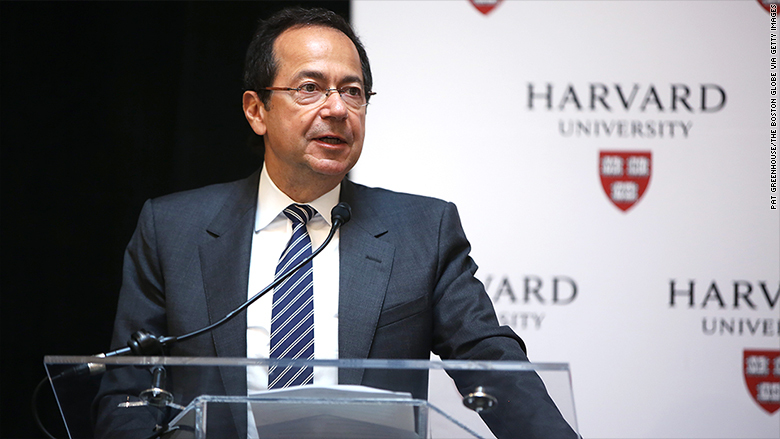 Hedge fund billionaire John Paulson has been buying a lot of sand lately -- specifically, Puerto Rican sand. Despite Puerto Rico's massive debt crisis, Paulson sees big profits ahead. He has plowed "quite a bit" -- an estimated $1.5 billion -- of his personal wealth into buying hotels, a resort and office buildings on the island. Paulson compares Puerto Rico today to Miami in the 1980s. "It's similar to that period in Miami's history," Paulson said Thursday at the Puerto Rico Investment Summit. "There was a lot of real estate on the beach, lots of abandoned buildings and vacant lots. That was definitely the best time to buy [in Miami]." Now he says it's Puerto Rico's turn. In addition to buying investment properties, Paulson also built a vacation home and bought an apartment for his family on the island. At the summit, Paulson clarified that most of these investments have been personal. They are not in the Paulson & Co. real estate funds. As for the $70 billion in Puerto Rican government debt that is making headlines, Paulson says his funds don't own any of it and neither does he. The island's government claims it doesn't have the money to pay bondholders. It recently proposed a dramatic "haircut" where creditors would lose money. Creditors argue that the island has enough revenue to pay up, but it spends too much on the wrong things. Paulson and other wealthy investors like Michael Tennebaum, who relocated to the island two months ago from California, are optimistic that the problems will get sorted out soon. "One reason I came here is I thought it hit bottom. In a democracy, you really need a crisis to bring about change," says Tennebaum, a former Bear Stearns executive. He is in the process of building a home on the island and starting a merchant bank. Paulson says people forget three things about Puerto Rico: It's the furthest point south in America, it's beautiful and it has a very well educated, bilingual workforce. "Puerto Rico is unique. You get the climate of being very far south with all the protections of the U.S.," he says. His big bets are buying the 5-star Condado Vanderbilt hotel in San Juan and the super high-end St. Regis Bahia Beach resort. On top of that, the island offers tremendous tax benefits to investors. In an effort to try to lure people like Tennebaum, the island passed laws -- known as Acts 20 and 22 -- to make many of their investment gains tax free. The influx of the rich to Puerto Rico is in contrast to a massive migration out of the island. After nearly a decade in recession and an unemployment rate over 12%, many Puerto Ricans are booking one-way tickets to Florida, Texas and other parts of the mainland. Paulson says he has not moved to the island "yet." While he is famous for foreseeing the 2008 financial and housing crises -- and profiting off of them -- his recent hedge fund performance has been disappointing. He has lost a lot of money on bets in Greece. Puerto Rico has been dubbed "America's Greece," but Governor Alejandro Garcia Padilla argues it could be worse. "Here in Puerto Rico, we have our issues to handle, but we don't have Trump winning in our polls," Garcia Padilla said Thursday.